In computing, booting is starting up a computer or computer appliance until it can be used. It can be initiated by hardware such as a button press or by software command. After the power is switched on, the computer is relatively dumb and can read only part of its storage called read-only memory (ROM). There, a small program is stored called firmware. It does power-on self-tests, and most importantly, allows accessing other types of memory like a hard disk and main memory. The firmware loads bigger programs into the computer's main memory and runs it. In general purpose computers, but additionally in smartphones and tablets, optionally a boot manager is run. The boot manager lets a user choose which operating system to run and set more complex parameters for it. The firmware or the boot manager then loads the boot loader into the memory and runs it. This piece of software is able to place an operating system kernel like Windows or Linux into the computer's main memory and run it. Afterwards, the kernel runs so-called user space software – well known is the graphical user interface (GUI), which lets the user log in to the computer or run some other applications. The whole process may take seconds to tenths of seconds on modern day general purpose computers. Early computers in the 1940s and 1950s were one-of-a-kind engineering efforts that could take weeks to program and program loading was one of many problems that had to be solved. 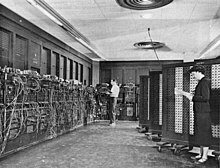 An early computer, ENIAC, had no program stored in memory, but was set up for each problem by a configuration of interconnecting cables. Bootstrapping did not apply to ENIAC, whose hardware configuration was ready for solving problems as soon as power was applied. The EDSAC system, the second stored-program computer to be built, used stepping switches to transfer a fixed program into memory when its start button was pressed. The program stored on this device, which David Wheeler completed in late 1948, loaded further instructions from punched tape and then executed them.